Tag Archives for " Alon Alroy "
Frost and Sullivan report that the live events industry is worth around $512 billion. 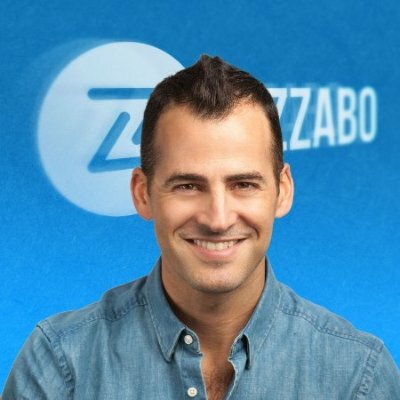 Alon Alroy, CMO of Bizzabo, explains how event marketers can measure and optimize their event marketing campaigns before during and after the event process. In an increasingly digital world, companies like Salesforce, Hubspot, and Airbnb are finding that live in-person events represent one of the most valuable opportunities to connect with a target audience. They aren’t the only ones. Forrester Research estimates that the average B2B CMO invests over 24% of their marketing budget in live events. Meanwhile, Frost and Sullivan report that the live events industry is worth around $512 billion. Whether you work for a corporation or for a small business, there is remarkable potential in event marketing. In order to get the most out of events, marketers should begin to look at them as year-round marketing campaigns that need to be optimized like any other. In this piece, we will explore how marketers can measure and optimize their event marketing strategies before, during, and after the event process. Like any other good or service, events exist in a world full of choices where it is very easy for someone to choose something other than what you are offering, or nothing at all. Through savvy event promotion, you can convince people that your event is worth attending—again, and again, and again. Just as other marketers trace the buyer’s journey, you must trace the attendee’s journey. What are the series of decisions and actions that potential attendees are taking as they consider your event? Let’s take a look at the below sample from our Using Event Data for Good eBook. Through analyzing data like the example above, event marketers can determine what channels are worth focusing on (in this case, organic search) and what channels should be a lower priority (here, social media and referrals). At the same time, this data also points to opportunities for improving your marketing strategy for a given channel through the process of multivariate (or A/B) testing. For example, if you wanted to increase the viability of social media, you could gradually tweak and optimize your social media graphics, post times, or copy and see how the conversions on your event website change from there. By performing multivariate tests and then optimizing your strategies for different channels based on the findings of those tests, you can maximize the amount of people who register for your event. It used to be that tracking metrics for in-person events was as limited as tracking snail mail. You could count the number of people who attended your event, interview them for qualitative feedback on what they liked and didn’t like, and (if you had enough manpower) count the number of people who showed up for each particular session. Today’s event technology grants organizers unparallelled access to real-time event data. For instance, some event apps host dedicated pages for speakers, sessions, and sponsors. By tracking the engagement that specific pages receive, event organizers can determine which speakers, sessions, and sponsors are most popular. Consider the below image from an event app dashboard. 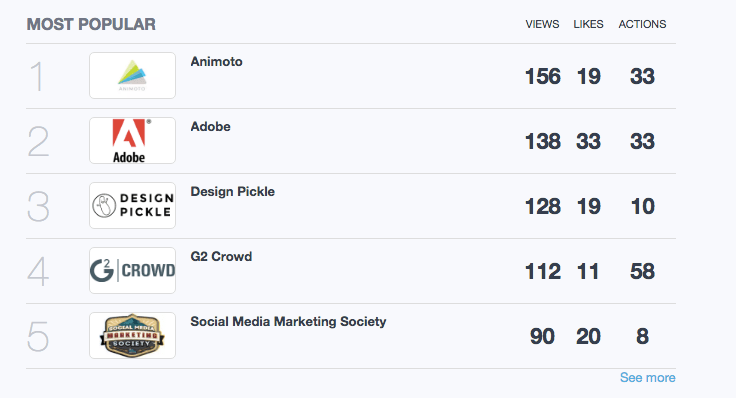 Notice how sponsors are ranked by attendee engagement, including in-app views, likes, and actions (or website visits). Being able to track this sort of attendee behavior not only helps event organizers identify the sorts of sponsors that work best for their event, it also helps them prove event ROI to valuable sponsors. When reporting to sponsors, it’s one thing to say that 500 people will attend your event. It’s another to say that over one-fifth of the attendees at the event viewed their event-app page. The same applies to in-app speaker pages and session pages. By tracking engagement with these pages, event marketers can determine which speakers and sessions are generating the most buzz and should definitely be included in a future event. 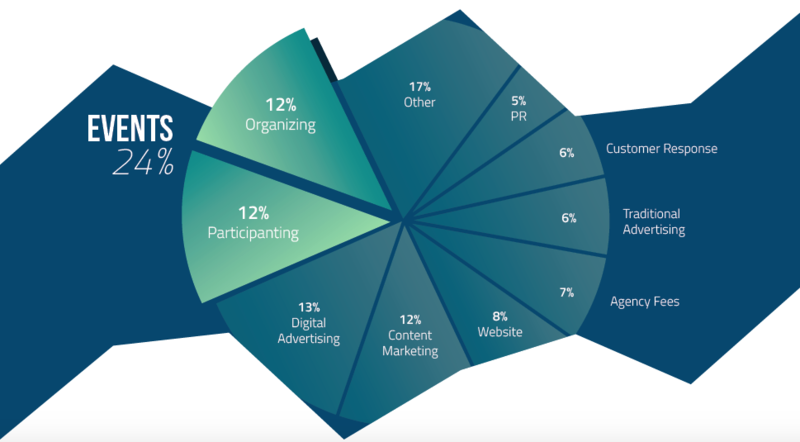 Furthermore, these analytics indicate to event organizers what their attendees are interested in, which can be used in other marketing campaigns on other channels. 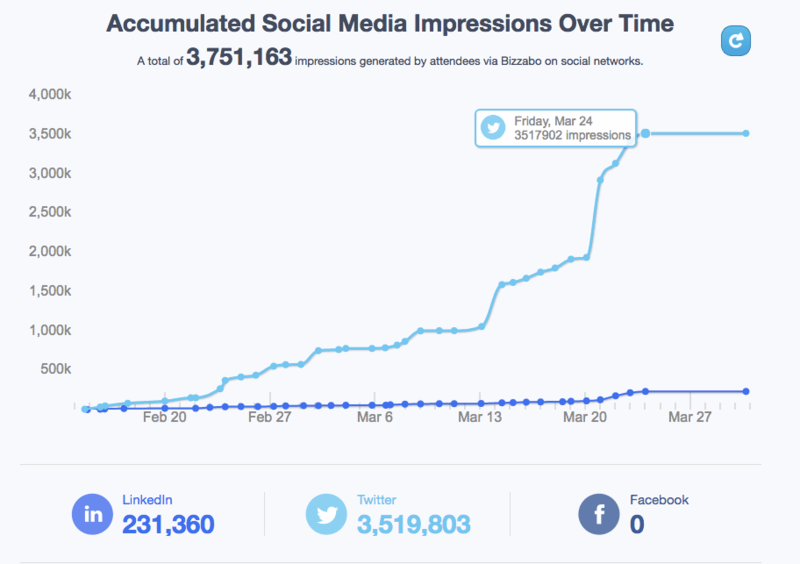 Another during-event metric worth tracking is social media engagement. The more social media engagement for your event, the more brand awareness, the more FOMO, and the more likely people will attend your event in the future. Although you can manually track hashtags and mentions, some solutions will automatically track this for you. In the above example, it looks like the event received over 200,000 impressions on LinkedIn and over 3.5 million impressions on Twitter for a combined total social media impressions of almost 4 million! Arming yourself with statistics like these will not only make it easier for you to measure and optimize your event marketing campaigns moving forward, it will also assist you in proving ROI to your teammates, speakers, and sponsors. Once the event is over, your work is not complete. There are still many valuable opportunities for optimizing your event marketing campaign (and promoting event content). You will want to gather feedback from your attendees and also distribute your event data to other departments in your organization. One of the first things that event marketers should do post-event is send out a net promoter score (NPS) survey to attendees. You can ask any number of questions, but one of the most valuable centers around how likely they are to recommend your event to a friend. Those who answer 8 – 10 are “promoters” and are likely to recommend your event to others. Those who answer 6 – 7 are “passives” and will likely not recommend or discourage people from attending your event. Anyone who answers 1 – 5 is a “detractor” and will likely tell people to NOT attend your event. The total percentage of promoters subtracted by the total percentage of detractors yields your net promoter score. If you have any detractors or passives, that is a big indicator that you can improve your event experience. As Jay Baer points out in his insightful book on customer service Hug Your Haters, your biggest critics can be your most valuable assets. Give them an opportunity to leave qualitative feedback in the survey you send out, follow-up with them and let them know that you value their perspective, and if you see a trend in critique, act on it. Getting feedback from your attendees is one aspect of post-event optimization. The other is optimizing the flow of information between the departments in your system. Where possible set up integrations between your event management platform (if you are using one) and the other platforms within your organization (e.g. CRMs, marketing automation software, customer success software). For instance, you could integrate your event management software with your CRM so that every time someone registers for your event they are added to a segmented list. You can then integrate your CRM with your marketing automation software so that these registrants are entered into a nurturing cadence. Some event management platforms will even allow you to cut the middleman and allow you to and allow you to enter registrants into marketing campaigns from within the event platform! The more consolidated your event data is, the more you will be able to focus on the success of your event. The writing’s on the wall. Events are becoming more popular, while data is becoming easier to track and analyze. By harnessing data and optimizing event marketing campaigns based on that data, marketers open up a world of value. Before the event begins, track and optimize the attendee journey so that you can get more people at your event. 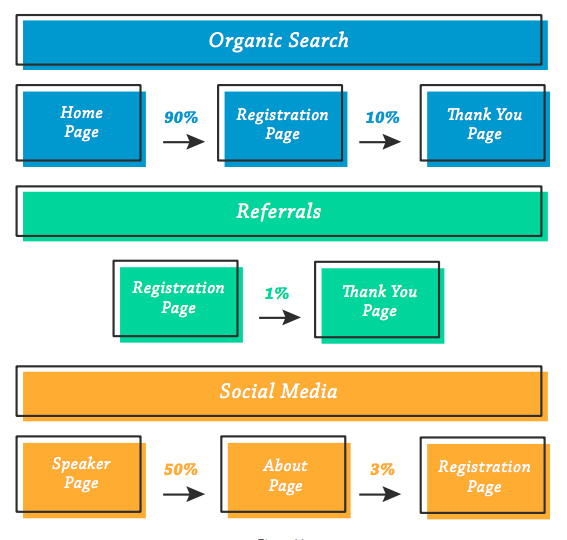 Implementing multivariate tests for your website, social media, and email cadences will help you figure out the most effective strategies for driving registrations for your event. Once the event begins, find ways to track attendee engagement with sponsors, speakers, and sessions—and also track engagement on social media. This will help you understand what your attendees’ value and will also help you demonstrate event ROI. After the event, utilize NPS surveys to learn from your attendees on how you could improve your event and find a way to integrate your event data to make your job easier. Ensuring a smooth flow of information between your systems will help you focus on the success of your event, not managing it. Alon Alroy is the Co-Founder and CMO of Bizzabo, the event technology company. The Bizzabo Events Cloud is used by thousands of event organizers from around the world and was selected by The Event Technology Awards, in two consecutive years, as The People Choice’s Award of the Favorite Event Technology Solution.